Homes available for sale as well as the housing supplies measured in months are now at pre-recession levels, while household formation continues to recover (see post). This development was predicted by William Wheaton back in 2009. Forbes: – Most striking however is the fact that inventory has contracted to its lowest level since December 1999, more than 13 years ago. The number of available homes, which is not seasonally adjusted, fell 4.9% from December and is 25.3% lower than a year ago. With 1.74 million homes on the market, at the current sales pace, supply will be exhausted in just over four months. 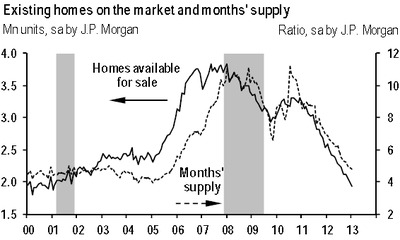 It represents the lowest housing supply since April 2005. In a normal market, a healthy supply level is about six months. A number of economists continue to talk about the shadow inventory – the millions of homes that are “about to hit the market” as homeowners have or shortly will fail on their mortgages. Some evidence suggests that in the more depressed housing areas banks are indeed sitting on foreclosed properties, unwilling to sell. But a number of banks have also been aggressively modifying mortgages, reducing principal and interest, and therefore cutting delinquencies. Clearly many more homes will be hitting the markets this year. But it really doesn’t make much difference if people who move out of these homes end up buying or renting – they need to live somewhere. And according to the Census Bureau, rental vacancies are near a 10-year low. 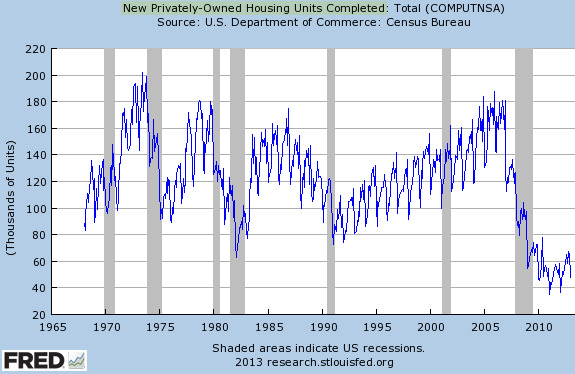 Ironically, the relatively tight credit conditions are (at least partially) restricting new home construction. Completion of new housing units has improved recently but remains at historically depressed levels – certainly not enough to keep up with the population growth and family formation. The danger of course is that with spring approaching (generally a period of increased demand for homes), some markets could overheat due to tight supplies, worsening home affordability and dampening sales numbers.